Crash Bandicoot? That is my childhood “crash”. We all know and have been playing this game, well some of us, was raised playing the game! And now? Is coming out a new series? And the characters? But,but… I was not ready for this! And it is Play Station 4 exclusive ! Completely remade from the ground up?! Holy ground, that is amazing. All of the Crash Bandicoot gamers just freaked out. 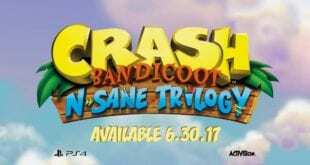 A new game would be incredible, but if this remastered trilogy sells well, we could see a resurgence of Crash Bandicoot. The Childhood memories are back! Can you imagine a new version of Crash Bandicoot? It’d be a mature-rated, epic story of Crash fighting and trying to save the bandicoot he loves from a doctor that performs “experiments” and mutates bodies. It’s like your parents were just thinking “what kind of present says ‘get good or get out’ to your child?” Right?! Well, just a quick info. I’m a fan of remastered. I think it’s great, everyone hates it because nostalgia is a powerful drug, but I’m all about it. This game will probably have a new crash design and new voice segments, probably even a cinematic who knows. I’m cautiously optimistic, but I hope they don’t mess up with the difficulty of it or its quirks. Remember, the fun of the game is in the level design and the skill you need to beat each level. They can easily dumb down some levels, add powers, or get rid of some aspects of the game that made it memorable in the first place. Will it be sold as three single games or merged and sold as one or a collection? Will it look like Skylanders so that it doesn’t look out of place and to get it out more quickly by sharing assets or will it really look like the originals just super polished? Was the background a hint how the remasters will look since it more than resembled the intro of N. Sanity Beach just flipped? Will the audio be remastered as well? If so, how? They will clean it or will they re-record it dialogues included? Is there going to be an option to switch the HD graphics off, like in some other 2in1 remasters, or will it be HD only? Will there be trophies or any other new additions or is it just about the technical aspect? How much will it need to sell to get a proper reboot/sequel? Well, lets wait and see on any final word from Naughty Dog and Activison.